A free monthly resource of tips for making baby food, inspirational recipes and anything else related to babies or children! If a friend did forward this to you, and if you like what you read, please subscribe by visiting Baby Food Bites. "You know what the great thing about babies is? They are like little bundles of hope. Like the future in a basket." Traditional May Day celebrations have origins that can be traced back to pre-Christian times and was a summer holiday in many pre-Christian European pagan cultures. As Christianity took hold in Europe, the pagan holidays lost their value, and May Day, which occurs on the 1st of May, slowly evolved into a secular celebration, from where the rituals of dancing around the maypole and crowning the Queen of May are popularly known. Being a traditional European festival, May Day is a national public holiday in many countries. Some countries also celebrate the 1st of May as Labour Day, as a result of it being chosen in the late 19th century as the date for International Workers’ Day, which celebrates labourers and the working classes. While it might be tempting to keep feeding your baby the same favourite foods, he will soon grow bored of these and then you will be out of ideas! Advance meal planning will help you rotate meals while also saving you precious time. Ahead of your weekly food shop, review the meals planned for the coming week and add any missing ingredients to your shopping list. This will also help you to mentally prepare for the week ahead and to better manage your busy schedule! Babies’ immature kidneys cannot process large amounts of salt, so avoid feeding your baby too much processed food, which is typically laden with salt. Also avoid adding additional salt to his food during the first two years, and remember to set aside your baby’s portion first before seasoning, if cooking a meal for the entire family. May is National Egg Month, so you can celebrate by trying this super easy recipe for Mixed Vegetable Frittata. A real crowd pleaser with babies, and leftovers are ideal for popping into your older child’s lunchbox. This recipe yields 3-4 servings for babies. Heat the oil, on medium heat, in a small frying pan. Add the potato, and fry gently until golden. Then add the mixed vegetables, and cook for a few more minutes until softened. In a bowl, combine the eggs together with the Parmesan and milk, and beat until well-mixed. Add the butter, if using, to the pan. When melted, pour the egg mixture over the vegetables, and cook slowly on low heat until the egg is set and the underside golden. The top will still be slightly wet. Place the pan under the pre-heated grill, and cook the top of the egg until golden. 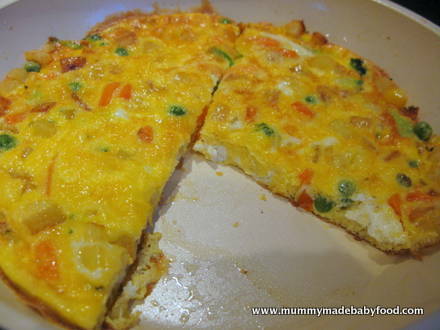 Allow the frittata to cool sufficiently before serving. If you chop it into small pieces, this makes the perfect finger food for baby. Time to get back to the little ones! Thanks for stopping by. Comments? Ideas? Feedback? I'd love to hear from you. Just reply to this newsletter, and let me know what you think!